Helping You Be An Even Better Driver. Drive Faster, Smarter & Have More Fun. Resources to help you improve your performance and/or race driving. Individually or as a group, in-person or remotely, Driver Coaching is the foundation of Speed Secrets. My promise is to provide the most complete driver coaching services available. Speed Secrets is your source for driving tips, articles, books, eBooks, eCourses, webinars & videos all aimed at one thing: to help you be an even better Performance or Race Driver and/or High Performance Driving Instructor. Seminars, workshops, keynote talks with a message: to help Performance or Race Drivers and/or High Performance Driving Instructors perform better, presented with a balance between education and entertainment. So, you don't only coach pro drivers? No! 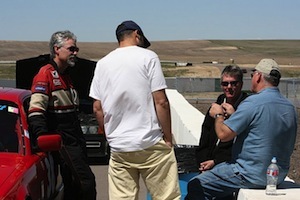 I enjoy coaching drivers of all levels of the sport, no matter what age, experience level, or type of motorsport. Actually, I pride myself on the fact that I work with all sorts of drivers, and I know it makes me a better coach because it forces me to relate to all levels. Is the content in your eBooks the same as in your Speed Secrets books? No, it’s all-new and different. If anything, it compliments what I’ve written in my Speed Secrets books. That can also be said for my Speed Secrets Weekly e-newsletter. A kinda motto I have is “As I learn, you should learn,” therefore I’m constantly writing new material. How can my club arrange to have you do a seminar or talk? Just have whoever is in charge of these types of events contact us by email. We’ll take it from there (but feel free to encourage those decision-makers…). We’ll give them all the information they need – pricing, availability, content, requirements, etc. Drop me a line anytime, and let me know how I can help you.